This silk scarf is created using collected maple, pecan and additional leaves lain across the surface to create a beautiful all natural design. Size 8" x 72", 100% pure silk. You can see the crystal clear leaf imprints and a natural dye that brings a beautiful purple color into the background with small spots of blue and pops of green from the leaves. Digital monitors do not do the subtle colors justice! The time involved to create each piece is part of my slow fashion collection. 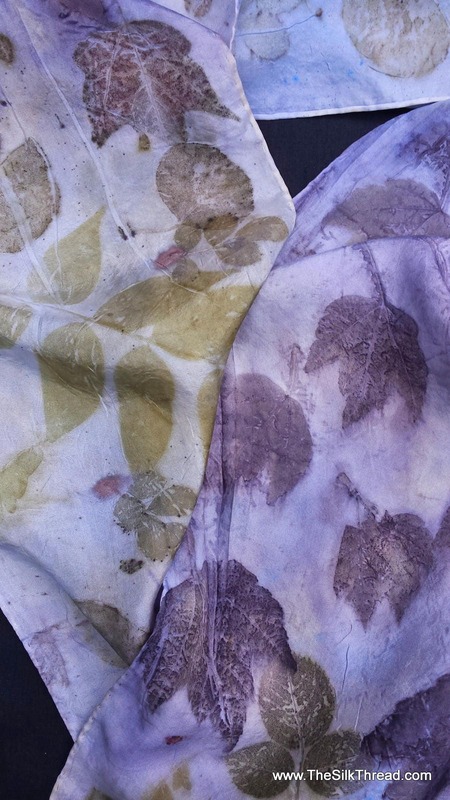 Eco dyeing or botanical printing involves collecting Nature's leaves, plants, fruit and flowers to imprint on the fiber. The process creates unique, all natural designs and colors drawn directly from the plant matter. All natural, sustainable and renewable art in beautiful colors. Each textile tells its own story. That is what makes it such an exciting and unique art form. Your scarf comes with a tag with the story of its making. A unique and unusual gift! Eco-friendly fashion art.